Palatka-Lake Butler Trail | Florida Hikes! 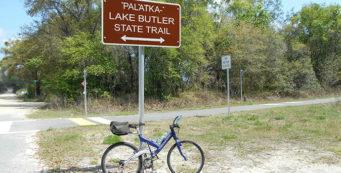 With a corridor spanning nearly 50 miles between Palatka and Lake Butler, the Palatka-Lake Butler State Trail provides two paved segments for riders and a lengthy unpaved corridor used by the Florida Trail between the north end of Keystone Heights and the New River. 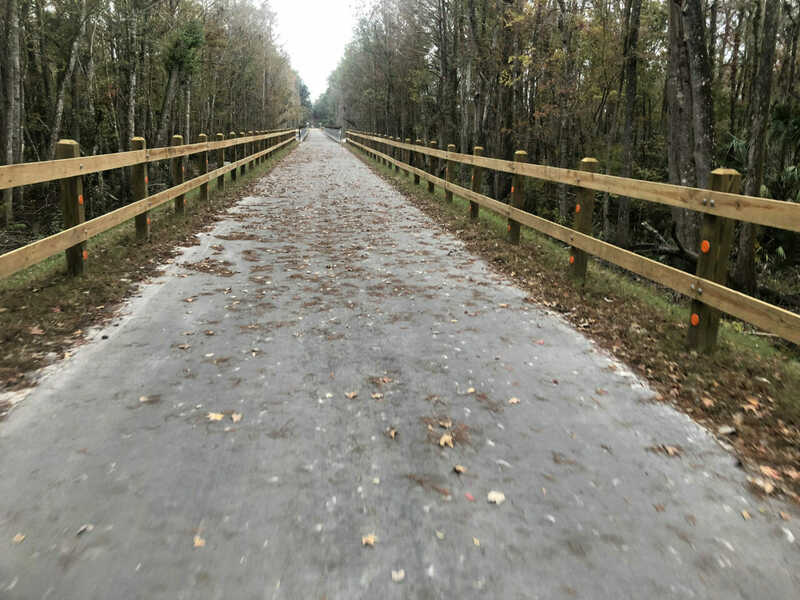 On our most recent visit to the trail, we discovered that paving is complete between Palatka and the northern end of Keystone Heights. Much of the northern end of the trail, 4.4 miles between the New River and Lake Butler, is also paved. Other portions remain unpaved but can be traversed with some jogs out to the highway around missing bridges. 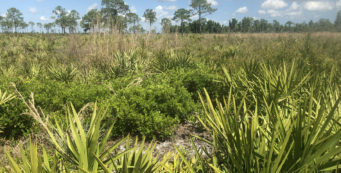 The trail now begins at a dirt parking area on the north side of SR 100, just west of both the Palatka Airport and the headquarters building for St. Johns Water Management District. Through this initial stretch, there are a number of raised embankments and bridges over marshes, and two road crossings, Bardin Rd being the busiest. The trail corridor is paralleled by SR 100, although there is enough of a screen of forest that you aren’t staring at cars. 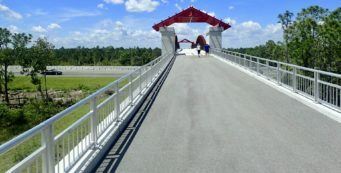 As you approach the new, long bridge that replaced the Rice Creek trestle, the Florida Trail joins the corridor after crossing SR 100 from Rice Creek Conservation Area. 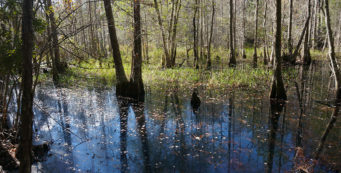 After the creek crossing, you pass a picturesque cypress swamp. There is a large unpaved parking area at Roberts Road in Carraway. 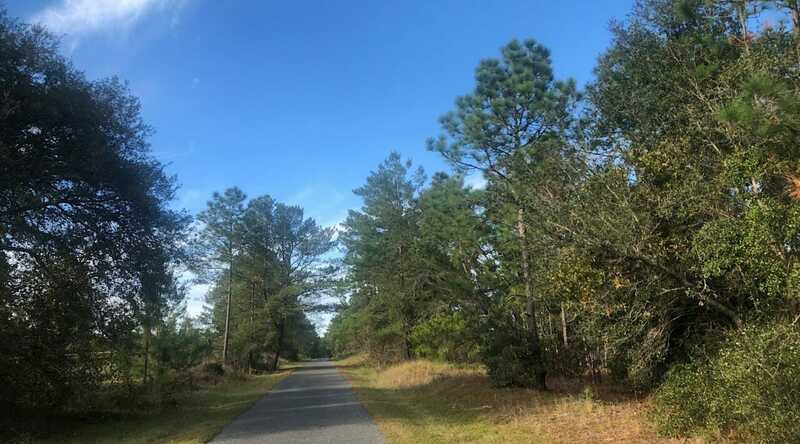 After 3.1 miles of sharing this paved route, the Florida Trail jumps off the corridor at Carraway Church Road, the next road crossing, where there is room for a car or two to park. North of Carraway, the bike path skims the edge of Etoniah Creek State Forest, passing a primitive camping area. 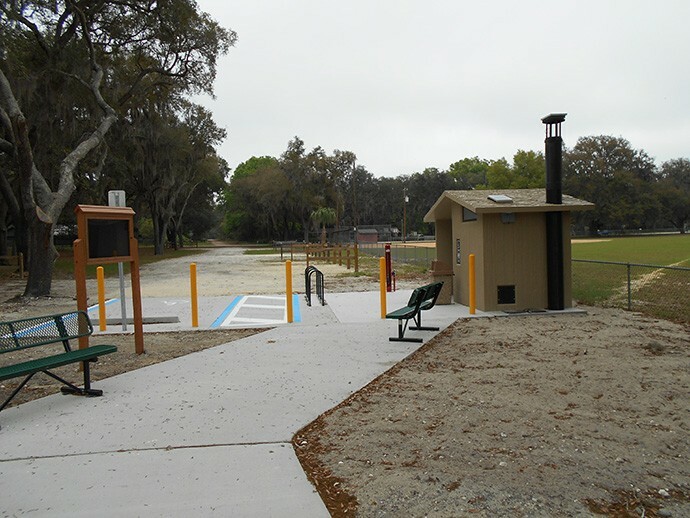 You’ll find a developed trailhead at Florahome with a restroom and water, as well as a nearby store. Another small store with cold drinks is at Putnam Hall. North of Putnam Hall, the trail diverges from the highway for a while to circle around some large prairies as it approaches Keystone Heights. It’s here you’ll find another trailhead – the first NOT along SR 100 – at Twin Lakes Park. There are picnic tables and restrooms here, too. As you arrive in Keystone Heights, you’ll find full services along the trail in Keystone Heights. 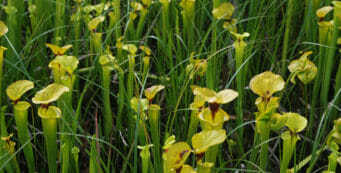 Lodging can be arranged (cabins or camping) at Mike Roess Gold Head Branch State Park, which is up a spur trail paralleling SR 21. Once you get to the north end of Keystone Heights, the pavement ends. Hikers following the Florida Trail meet the railbed as they leave the north end of the roadwalk through Keystone Heights at NW 75th St and stay on it for 25.5 miles. 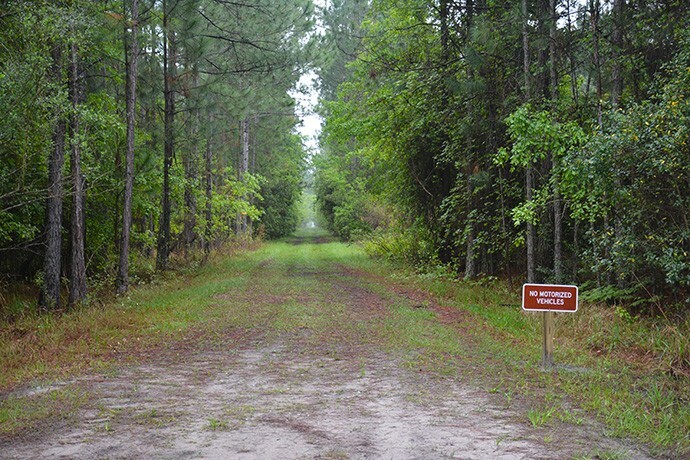 This unpaved section continues through Hampton, crossing US 301 to tunnel through timberlands southwest of Starke. Orange blazes lead you out to the highway twice to use highway bridges to cross waterways, the New River being the most significant one. On the north side of the New River the pavement resumes as you pass the mid-point of the statewide Florida Trail near a sawmill. 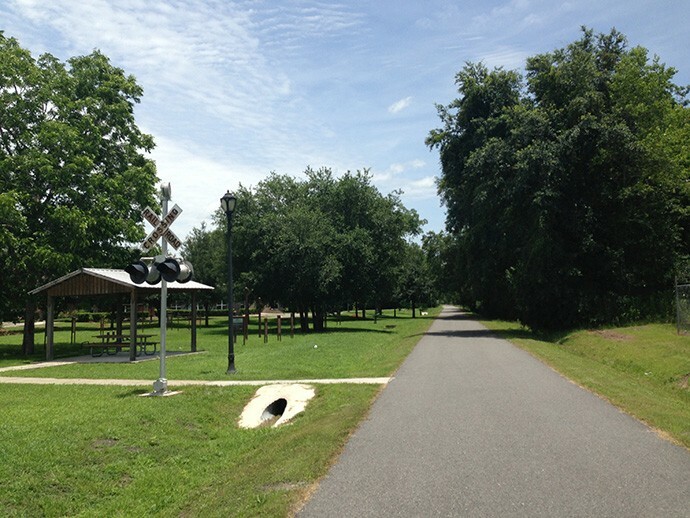 The paved trail crosses city streets and a highway as it comes into downtown Lake Butler, with the Union Depot serving as a nice terminus parking area. 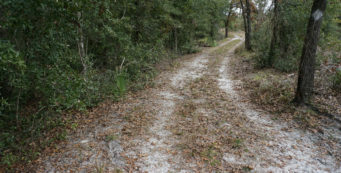 Florida Trail, New River to Hampton (6/23/2016)- A surprisingly pleasant section of the Florida Trail that sees very few hikers, the most remote part of the Palatka-Lake Butler Trail stretches 9.3 miles between Hampton and the New River, southwest of Starke. 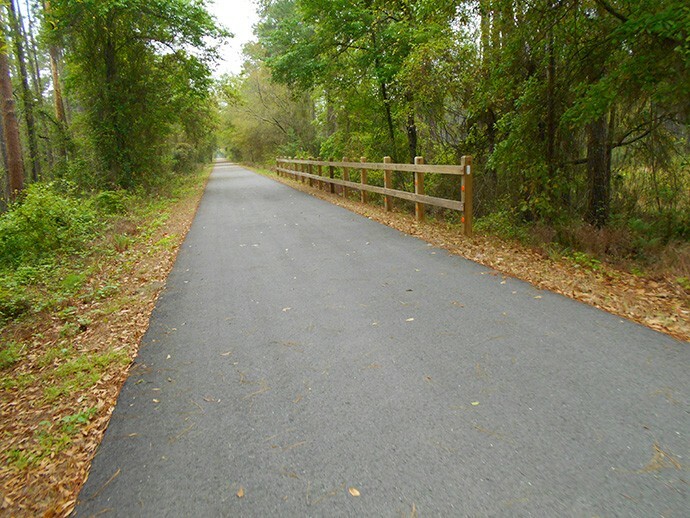 Lake Butler Trail (9/4/2015)- There aren't a lot of places you can (or should) bike down the Florida Trail, but the Lake Butler Trail in Union County is a nice country bike path that shares the trail with hikers.